Al Roker shared what's quite possibly the happiest set of photos on anyone's social media timeline. Roker stopped by to say hello to the newest member of the "Today" show family, Hoda Kotb's new daughter, Hope Catherine. The 64-year-old anchor posted photos from his visit. A string of blasts hit high-end hotels and churches in Sri Lanka on Sunday, injuring hundreds of people as worshippers attended Easter services. The first explosions were reported at St Anthony's Church in Colombo and St Sebastian's in the town of Negombo just outside the capital. 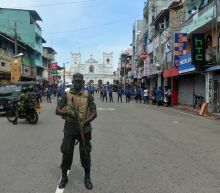 At least 160 people injured in the St Anthony's blast had been admitted to the Colombo National Hospital by mid-morning, an official told AFP. US Secretary of State Mike Pompeo said Friday he was "still in charge of the team" negotiating with North Korea over its nuclear program, after Pyongyang demanded he be removed from the talks. "Nothing has changed," Pompeo told a news conference after a meeting with Japan's foreign and defense ministers. North Korea this week demanded that Pompeo be excluded from future talks after he apparently encouraged President Donald Trump to stand firm during a summit in Hanoi with North Korean leader Kim Jong Un.